I’m almost as passionate about eating a healthy breakfast as I am about eating lots of butter. They’re both super important. Therefore…feel free to spread butter all over your breakfast. Oh yeah. But wait. You don’t have time to cook a healthy breakfast every morning? Me neither. 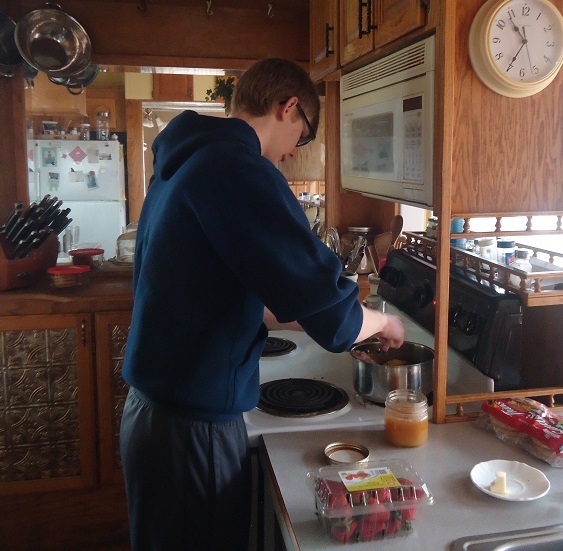 I mean, if I felt like losing an hour of sleep, skipping my much needed Bible time, foregoing my morning work-out, or beginning my day by being glued to a griddle while flipping countless pancakes – I could make the time to cook a healthy, hearty breakfast every morning. But well…I don’t. That’s what scares us away from making a healthy breakfast isn’t it? Time. Effort. School. Work. Schedules. I get it. I’m with ya. I have plenty of other things to do in the morning and I like sleeping. I don’t like the stress of trying to get everyone going in the morning while trying to keep breakfast from burning on the stove. So does that mean we take the easy way out and buy boxed, convenience foods for breakfast? Sure, if you want to feel like junk all day and start your kids’ school day off with a big, blurry bang that ends in a sugar crash by morning recess. But what if there is a way to have a nourishing breakfast without the morning stress? Oh yes. There is definitely a way. I am loving this real food reality which includes a hearty, healthy, no brainer breakfast each morning. How do I put a healthy breakfast on the table without much effort each morning? I set out the Homemade Instant Oatmeal and let the kids make a bowl when they get up. Seriously, making a healthy breakfast is not hard. We do not have to resort to boxed food. It’s just a matter of planning ahead and focusing on food that is real and nourishing. Real food – it is amazing. 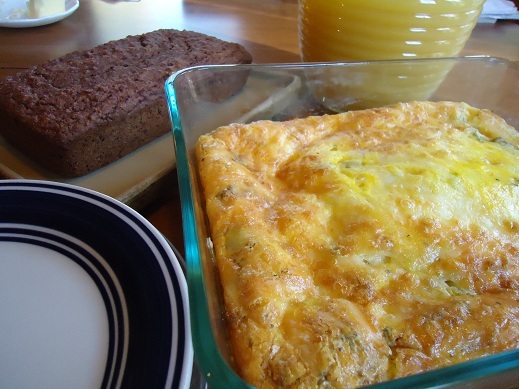 Prepare an Easy Breakfast Casserole and simply take it out of the fridge and bake it in the morning. Make Simple Whole Wheat Pancakes or Whole Wheat Waffles, allow them to cool, freeze them, then toast them to warm them up for a convenient breakfast just like an Eggo Waffle…except cheaper and healthier. Mix up and roll out biscuits, freezing them for a quick breakfast. Cook bacon or Turkey Sausage, then simply reheat in the morning or cook it up with some eggs. Throw yogurt and frozen fruit into the blender for a smoothie. Make muffin batter and put it in the freezer for fast, fresh muffins in the morning (one of my favorite freezer cooking tips!). Bake breakfast bars in the evening before closing up the kitchen. Make a batch of Easy Granola, Dark Chocolate Almond Granola, or Grape Nuts Cereal to grab and eat in the morning. As soon as we start making some healthy foods ahead of time, and stop assuming that eating healthy food is difficult, we’ll be well on our way to saving money and keeping our lives so much simpler in the kitchen! Plus, when we begin our day with a nourishing breakfast, we get our body off to a great start – setting the pace for a great day ahead. Need some easy, healthy breakfast inspiration? We have a freebie for you! 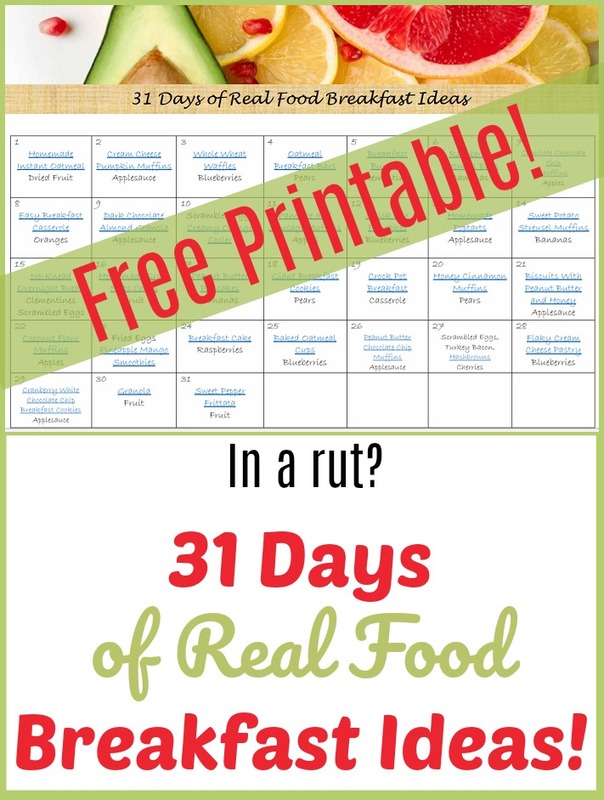 To help us all along in this effort, I created a downloadable chart with 31 Days of Real Food Breakfast Ideas. It is internet linked, so all you have to do is click to find the recipe referred to on the chart. There you go – 31 healthy, make-ahead, family friendly, money-saving, real food breakfast ideas! 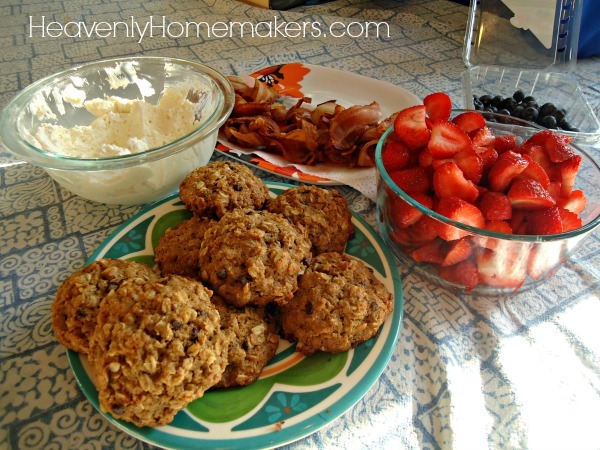 What are your favorite ways to get a healthy breakfast on the table quickly in the morning? This post is sponsored by Great Homeschool Conventions. I am honored to be working with them to spread the word about the wonderful conventions they offer! 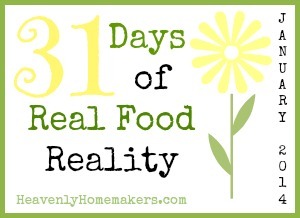 How have you been enjoying the 31 Days of Real Food Reality series so far? I pray it’s been helpful to you! 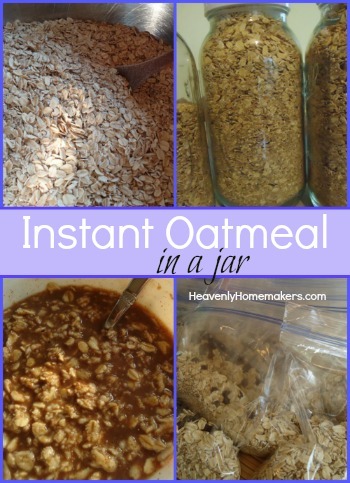 On another note, I have to give a big shout out to the Homemade Instant Oatmeal recipe. 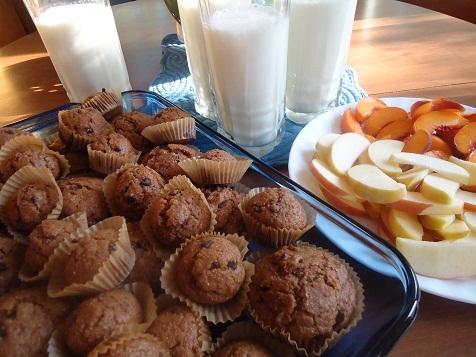 A healthy breakfast (or snack) does not get any easier than this. It takes about five minutes for me to mix up a double batch of this oatmeal. I store it in a jar in my pantry, then scoop it out and add boiling water when we want it for breakfast. Better yet, my kids can make a bowl of oatmeal for themselves. Love this! Saturday, January 18 – Elias’ b-day! 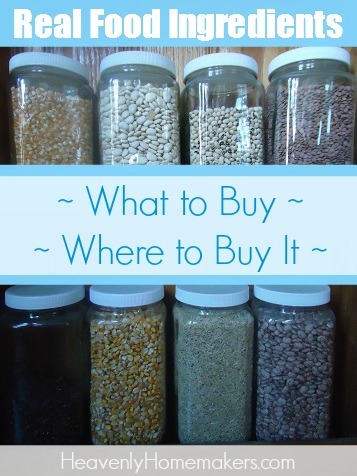 Not sure where to start when it comes to shopping for healthy, real food ingredients? No problem! I have an entire page on my site dedicated to sharing what foods I buy regularly and where I usually purchase them. Many people assume that you either have to live on a farm or live in a big city in order to find sources for healthy food. Not true at all! I live neither on a farm, nor in a big city. I live in a small town with two locally owned grocery stores and a Wal-mart. The nearest Whole Foods, Trader Joes, Natural Grocers stores are about an hour away – which means we are only privileged to shop in those stores a few times a year when we happen to be in the city for appointments or soccer games. So what are my options? I buy from farms close-by, I buy from a food co-op, I buy online, and I buy the rest from our local grocery stores and Wal-mart. When I do happen to be in the city and can shop at a more specialized whole foods store, it’s a blast! But since those opportunities are rare, I sure do love having access to the internet and my food co-op! Let these detailed lists offer you guidance as you transform your kitchen. Anytime I find online sales on these whole food ingredients, I always share them with you within a post so that you can benefit too. The ability to order healthy food ingredients online is a wonderful blessing! Head on over to our Real Food Ingredient Resource Page to learn more about how I shop. What are your favorite places to shop for real food ingredients? 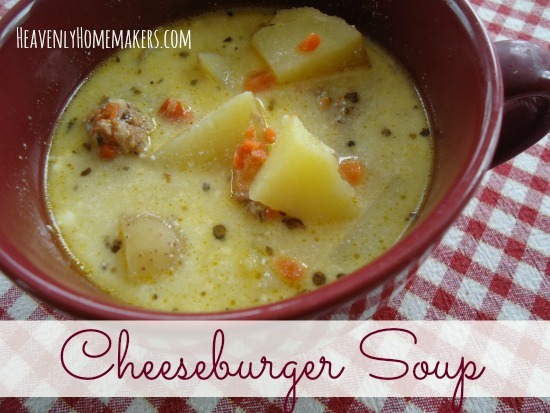 How about some Cheeseburger Soup for less than $1.00 per person? It’s a real food recipe that most everyone will love. It’s full of nourishing goodness. After all, there’s chicken broth and carrots in it, not to mention delicious beef, cheese, milk, and sour cream. It’s a full meal all on its own. Just like all of the recipes I share, this one won’t appear to anyone as “health food.” It’s simply delicious food. Comfort food. And yep, it just so happens to be healthy. I found that this recipe yielded six hearty servings. I did the math on it, and can declare it to be a Dollar Menu Dish. Technically, it cost me just over a dollar per person to feed this to my family. I decided, eh, it counts. :) So what does it mean that this meal costs about a dollar per person? It means that healthy eating doesn’t have to be expensive! I love it that there are so many economical ways to feed a family well. If you don’t mind adding a little extra expense to this soup, and you really want to make it appealing to those among you who just might be afraid of anything healthy – try adding 1/4 – 1/2 pound of chopped, cooked bacon. Then it becomes Bacon Cheeseburger Soup, and who wouldn’t want to eat that? By the way: Bacon is real food. Hallelujah! In a large pot, brown hamburger meat with onions, carrots, basil, and parsley. Once thoroughly cooked, add chicken broth and potatoes. Bring to a boil, then reduce heat to medium while potatoes cook, about ten minutes. Once the potatoes are tender, add milk, stirring and cooking until bubbly - about two minutes. Remove from heat. Add cheese and sour cream, stirring until melted. Serve. Have you found ways to keep real food eating within a reasonable budget for your family? I shrugged, smiled, and responded by doing what any wise mother would do: I slunk down under the table, never to return. At that point, it became clear to me that I had created a monster. Four monsters actually, but thankfully the littlest one couldn’t talk yet. See, when we were transitioning to a whole foods diet several years ago, my kids, who were used to being served meals from a box or a can, found themselves with a freaked-out sort of mama. I swung our food pendulum from one side to the other, and became afraid of anything that wasn’t organic, grass fed, soaked, fermented, and free of all additives, dyes, flavorings – and felt that I would certainly be poisoning us all if even a morsel of it crossed our lips. I did exactly what I now encourage you all NOT to do as you baby step your way toward real food cooking and eating. In an effort to educate my kids as we were making seven hundred changes all at one time, I spoke way too often about what was healthy, and what wasn’t. Part of this was good. I believe we need to make our family aware of the good, the bad, and the ugly when it comes to healthy eating. They need to understand why we’re opting to make changes in the kitchen. It’s only fair. But particularly if you have kids or a husband who is not excited about making healthy changes, and definitely so that your kids won’t throw you under the bus when someone feeds you something that might just contain a bit of Velveeta or MSG – it’s a very good idea to chill out with the “we are now eating health food” family conversations. There is no need to make a big shebang at each meal as you announce that: “The healthy, real food meal is now on the table, and it will nourish us all so much better than the processed food we used to eat, especially since it contains leafy greens and abundant antioxidants…” I mean, maybe that will make your family come running to the table with eagerness, but I’m pretty sure if you just place the nourishing, well balanced meal on the table and holler, “The pot roast is ready!” they’ll be much more relaxed as they join you for the feast. See, here’s the deal: The healthy food we should be eating? All of this real food I’m always talking about and encouraging you to focus on? It’s all just…food. When my grandma served her chicken soup, pickled beets, homemade bread, and real butter – while it was all very healthy, in her mind, she was simply serving food. It was food in its whole form, so without even trying, she was serving us “health food.” But it would have made her chuckle for someone to call it that. Create yummy dishes. Make tasty snacks. Use real food while you’re cooking and baking. Know that you are putting together delicious, real, whole, healthy food for your family, and that it can be as simple as Grandma’s fried chicken. To give an example of this, tomorrow’s Real Food Reality post includes a recipe for Cheeseburger Soup. It’s a real food recipe, filled with wholesome goodness, but no one would eat it and declare, “Oh, what wonderful health food we are eating.” They’ll just devour it and call it wonderful. Oh how I love recipes like this. Can’t wait to share it with you! Have your kids ever embarrassed you by proclaiming someone else’s food to be unhealthy? Come….come join me under the mortified mom’s table. 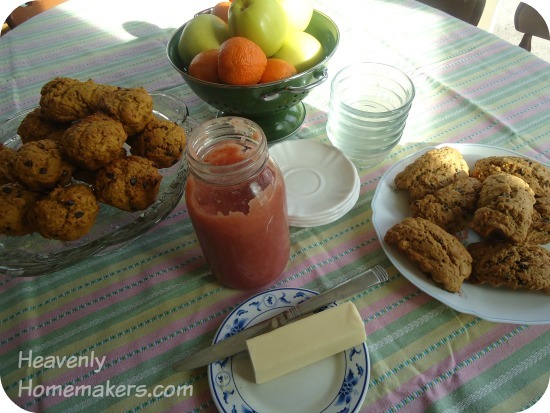 Real Food Reality Resources Package – Wait Till You See This! It’s everything you need to gently walk through your journey to a Real Food Kitchen. Don’t know where to start? Can’t even find your kitchen? Hoping to save money and time? Need as many menu planning ideas as you can get? Check, check, check, check, and then some. This package covers it all! The You Can Do This! eCourse automatically comes with a free set of What To Do With the Chicken in Your Kitchen Recipe Cards, which includes 24 delicious, real food chicken recipes on cute, printable cards. Enjoy this free bonus worth an additional $6! 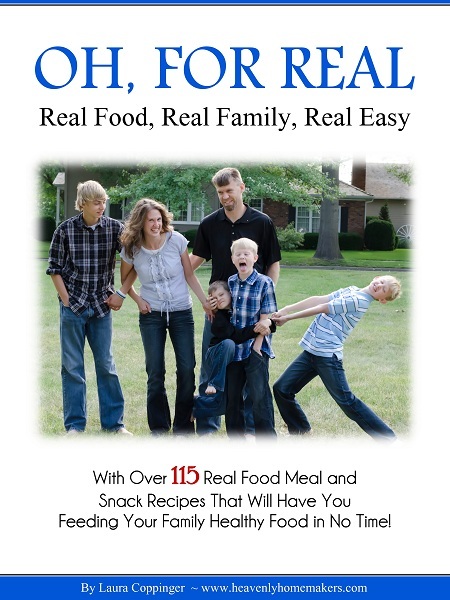 I must also encourage you to purchase my Oh, For Real: Real Food, Real Family, Real Easy printed cookbook. It’s a wonderful resource to have in your hands and in your kitchen. Consider adding the book to this purchase and we’ll get it sent out to you right away. 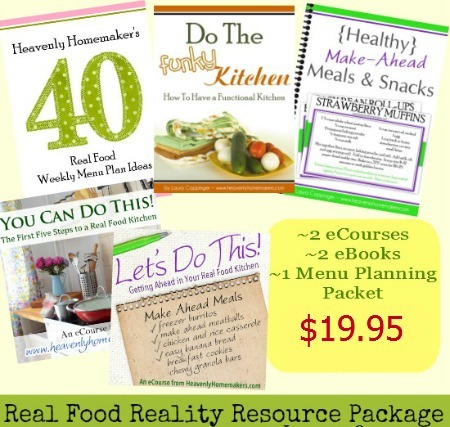 Just want the Real Food Reality Resources Package? 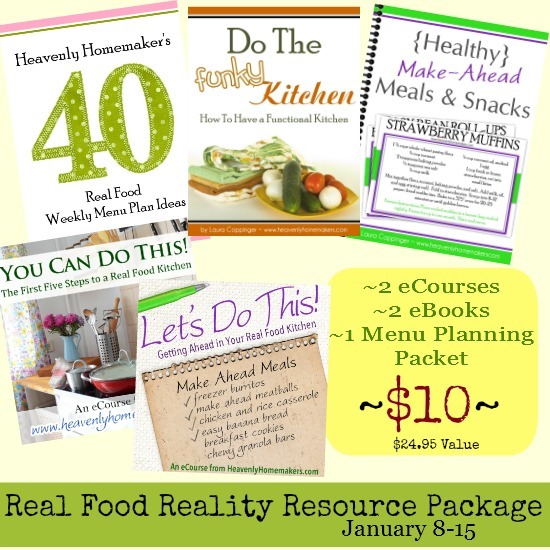 Our goal is that these resources will be a blessing to you as you venture on this real food journey! Here’s a fun feature in our 31 Days to Real Food Reality: Tropical Traditions, one of my favorite sources for real food, has put together a great whole food package to give away! Why do I love Tropical Traditions? Because I can count on every product they carry to be the highest quality available…anywhere. Their site offers only food that nourishes. Their prices are fair, considering the amazing quality of the food and the work it takes to produce such food. But that still sometimes means that their prices are outside my budget. I’ve found that the best way to afford their products is to wait for a free shipping weekend and pair it with sale prices. They offer free shipping every few weeks, with great buy one get one free sales and other discounts at the same time. When I shop that way, I score big time. I’ll be sure to continue keeping you updated on their free shipping and sale items as they come along! Leave a comment on this post for a chance to win this package. They also request that the winner of this giveaway is on their newsletter list, so head over there and sign up! I’ll draw a random winner on Friday, January 10. Be watching for a post stating your name as you will be responsible for contacting me if your name is chosen. It was way back in my “eating low-fat” days as a college student and young married gal. I would eat a bowl of low-fat cereal with skim milk for breakfast. Lunch might be a turkey sandwich with low fat mayo on “light” bread, and a side of fat free chips (aka salted cardboard). For a snack, I’d have Pepsi and Twizzlers, which are both fat free. Dinner would be any variety of food made with skinless chicken breast, white pasta or potatoes, and maybe a salad with fat free dressing. At the end of the day, I would feel great about how I’d eaten for the day. “I’ve had hardly any fat today!” I would say to myself. That’s what I thought it meant to eat healthy. There is a common truth in the way I used to think about eating and what I know believe about eating: I need to be aware of what I’m putting into my mouth because it is important to eat a healthy diet. What I didn’t recognize then, however, was that food isn’t just meant to fill a hole. Food is meant to nourish us. I was getting very little nourishment when I ate a low-fat diet. Why? Because nourishment wasn’t my focus. My focus was on avoiding fat, not on consuming nutrients. Somehow, candy and soda made it on my “healthy” list. Whether eating low-fat or not, I’m going to venture to suggest that there are many who are consuming very little nourishment. Even people who over-eat. How can this be? 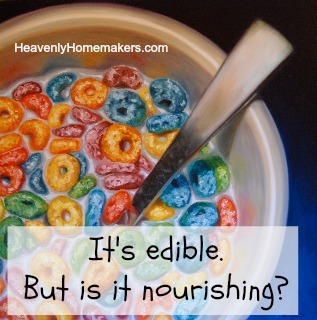 Well, there are many edible products on the market that fill a hole, but offer very little nourishment. What nutrients are found in a bag of chips? A slice of white bread? A box of crackers? A box of cereal? A slice of American cheese? Please don’t hear me heaping on guilt to those of you who are still eating many of those foods. Hey, I eat chips, cereal, and crackers sometimes too. It’s fun, it tastes good, and we enjoy the occasional treat. But I also know that if that’s all we were eating, we would not be receiving much nourishment – I don’t care how fortified the box claims its contents to be. When making healthy food choices, we must always consider how much nourishment it will give our bodies. Crackers are a fun snack and may hold our kids over until dinner, but are they doing much to give their bodies needed nutrients and fuel? A well-balanced diet of healthy fats, lots of fruits and vegetables, meats, dairy, rich broths, nuts, and few whole grains will give our body what it needs to thrive! When not given foods filled with nutrients, our bodies can make do for a while, but then we become depleted and sick. Sickness takes on many forms, from sluggishness to disease to everything in between. Fill your body with food meant to nourish! What’s great: Nourishment comes in all forms of deliciousness. Our list of options for real food nourishment is longer than my leg, because God is good to give us wonderful variety! This real food thing just keeps getting better all the time, doesn’t it? What’s your favorite form of nourishment? When you picture foods that fuel the body well, what foods comes to mind? During our 31 Days of Real Food Reality, I’ll be including my normal weekly menus as part of the series. Why? Because these menus are very much a part of my family’s real food reality. I want them to show you how simple it is to put together real food meals! Here’s another part of my Real Food Reality: I don’t always stick to my weekly menus. Sometimes what I have planned on Sunday doesn’t sound good by Thursday. Sometimes I forget to thaw the meat. Sometimes I just don’t feel like being tied down to a menu. And sometimes we have leftovers I wasn’t expecting, so we ditch the menu in order to clean out the fridge so that food doesn’t go to waste. I consider my menu plans to be a guideline to follow…and that’s it. 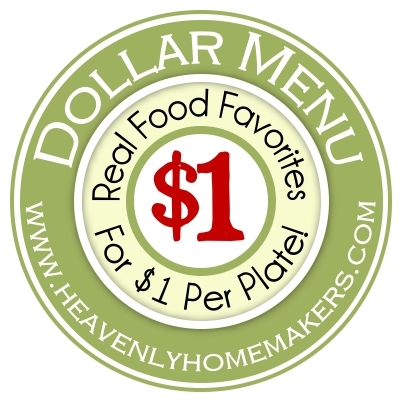 Feel free to use my menu plans to give you ideas, suggestions, and inspiration to make real food a reality for you! 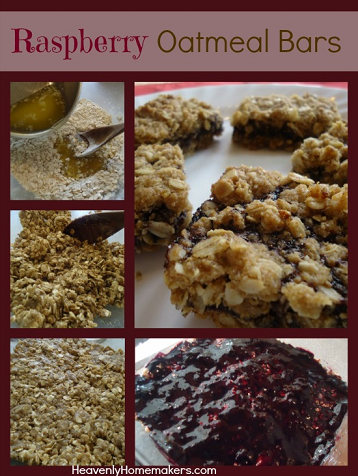 These Raspberry Oatmeal Bars have become one of our favorite snack and breakfast foods. I love that they can quickly be made anytime I have some spare minutes, then eaten when we need them. 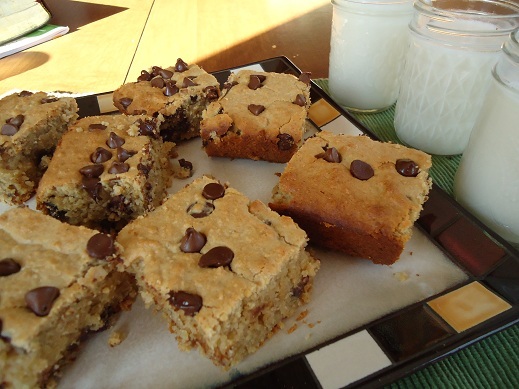 They are perfect to make in the evening to serve for a ready-made breakfast! Tell us your thoughts on how menu planning fits in with your real food reality! PART-TIME BUSINESS FOR FULL-TIME MOMS! I believe we can all agree that this fella was one of the healthiest, meatiest, happiest little (giant) free range turkeys around. There is no question that free range, grass fed, pasture raised animals with college degrees produce a more nutritious food compared to that which is produced from animals raised in less healthy environments. There is also no question that these food products can be very expensive and/or difficult to obtain. Sometimes, buying these farm raised products is just too far outside of the budget. Sometimes, there’s not a free range critter to be found anywhere close to where you live. So if you are someone who is not able to put free range food on the table, will you please stop feeling bad about it? God is bigger than a free range chicken, yes? This means that He is also bigger than a chicken that is raised in less than perfect circumstances. 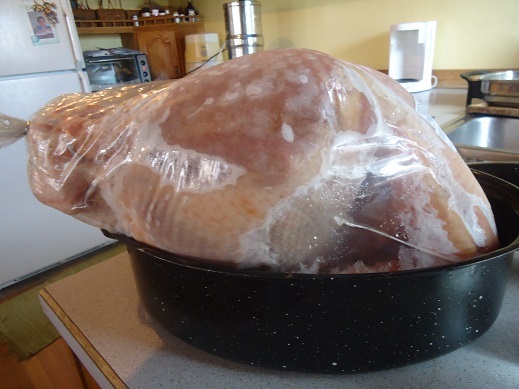 By golly, He’s even bigger than the turkey that wouldn’t fit in my pan at Thanksgiving, and that was one huge turkey. Not able to make a meatloaf with grass fed beef? Raw milk too far outside your budget? Stop feeling guilty. Stop worrying. God knows your desires and your ideals for your family. He will bless your efforts to feed your family nutritious food. Continue seeking out healthy options that will work for your family. Maybe an affordable free range chicken will find its way to your front porch someday soon. In the meantime, know that just because you don’t have access to the healthiest meat, eggs, and milk in town doesn’t mean you should throw your hands in the air and give up on eating real food. A store-bought egg scrambled up in butter or coconut oil is still loads better for you than any processed food that comes in a box which contains 62 ingredients. Loads better. It’s still an egg. That means it’s a real food. Relax. God is big, bigger, biggest. Take all the complicated details out of the process of switching your kitchen to a real food kitchen, and just focus on going back to the basics – whatever that may look like for you right now. So what does that look like for you right now? Have you found peace in your circumstances with food sources?